The boat slips smoothly through the dark water, the engine’s low hum a bass note to the alto ripple of water on the steel hull. Trees reach towards each other from close to the water’s edge, not quite meeting above the canal, and the slight damp under the canopy is cool on my face. The constant dance of light through the leaves patterns the water, the floor, the walls, the inside of my lids – now brighter, now darker, caressing, always changing. A small flash of blue neon in the shallows and shadows, glimpsed from the corner of the eye, was the most we would see of the kingfisher. The moorhens are skittish, flashing their white tails as they dart into the reeds and low branches of the margins. They pop out again when we’ve passed, zigzagging about and squawking their comments to each other. Guardian of this stretch of water is the heron, far too grand to hurry. He stands and waits as we approach, attentive to any possibility of fish disturbed by our passing. As our bow draws level he slightly crouches. In slow motion he springs up and with soundless flaps glides a hundred feet further along the bank. He then alights, folds his wings, and settles imperiously to wait. The thick bright moss on low branches and edge stones contrasts with the washed-out tones of brown and ochre of a rainy autumn, and the air is vaguely musty with slow decay. Occasionally we catch a glimpse to one side of distant farmland open to the thin sunshine, of rich pastures and pale gold stubble. On the other side, the land slopes upward through the trees, towards invisible possibilities. Recent storms mean the towpath is virtually impassable, the runoff from the hillside lingering on the level before trickling into the canal. Often inches deep in water or mud, nowhere invites me to get off and walk alongside. Nowhere beckons for us to stop and stay – just keep moving, passing through. Around a bend, we spot a fairy-tale clearing on the edge of the wood, where gloom gives way to brightness and there is a neat, understated building, with cedar shingles weathered grey as if it had grown from the worn undergrowth. A couple of gnarled apple trees mean even the clearing is shaded. There is a landing, and we tie up the boat and enter. The slight October sun is welcome on our shoulders. The inside is grey with stone and concrete floors, dusty whitewashed walls, discrete cobwebs, shelves of unglazed pots and bowls. Shelves and tables display finished glaze ware – the colours soft, muted, taken from the canalscape of this place. Through a doorway, we can see the potter’s wheel – more of the grey of dried clay splashed about, jumble of jars with brushes and tools on a shelf or two. More cobwebs, and an earthen taste hanging in the air. The bowl that draws me fits in my palm. It has the slight texture of terracotta, but warm grey like a collared dove. 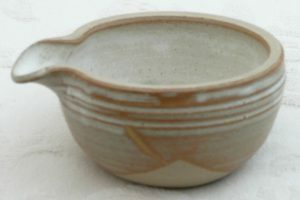 The concentric ridges left by the potter’s hands are like ripples where a branch touches the canal. The matte glaze is the colour of a cloudy late afternoon – neither grey nor ivory, quite – and dipped in thin shadows of last year’s bracken. At home now, that small bowl holds memories of the journey – ripples on the water, brindled clouds and faded autumn days.